A better name for this spicy chicken salad would be ‘absolutely fantastic, totally different, outrageously great chicken salad’, but that’s too long for a blog post title. This is not your typical chicken salad. Sure, it’s creamy, but there are special, unexpected ingredients in there too. Like cheese (in a chicken salad????!). And bell pepper (why didn’t I think of that? It adds great crunch and flavor). And tart sour cream???! And my favorite flavors, spicy smoky chipotle and cooling creamy avocado. What a great chicken salad this is! I wouldn’t change a thing about this spicy chicken salad. If you aren’t going to use the entire batch at once, I do recommend that you only mix in avocado with what you will use. The avocado isn’t going to keep for long. You’re better off mixing it in when you need it. Got leftover fried chicken? Also try my fried chicken salad. It’s crazy good on sandwiches too. Place the mayonnaise, sour cream, lime juice, salt, garlic powder, chipotle powder, onion powder and cumin in a large bowl. Whisk until smooth. Add the chicken, bell pepper and cheese and stir. Cover and refrigerate for 15 minutes. Gently fold in the avocado and serve on bread, in wraps, or on crispy lettuce. The original recipe for chicken salad crescents on the Plain Chicken blog was for small bite-sized rolls, perfect for a party appetizer. I decided to go big and serve them as the main course for lunch, and they were perfect! The super-light crunchy dough makes for the perfect wrapper around chicken salad. You can use your own chicken salad recipe of course, but I was particularly fond this version, which has Worcestershire sauce in it. The Worcestershire really added a great flavor dimension along with the extra sharp cheddar. They were fantastic! If you do use your own chicken salad recipe, you might want to cut down on the mayonnaise. You want the salad to be thick, not too thick, but thick enough to stand up to 20 minutes in the oven. Too thin and it’s going to run all over the place, leaving you with a pan of sadness! 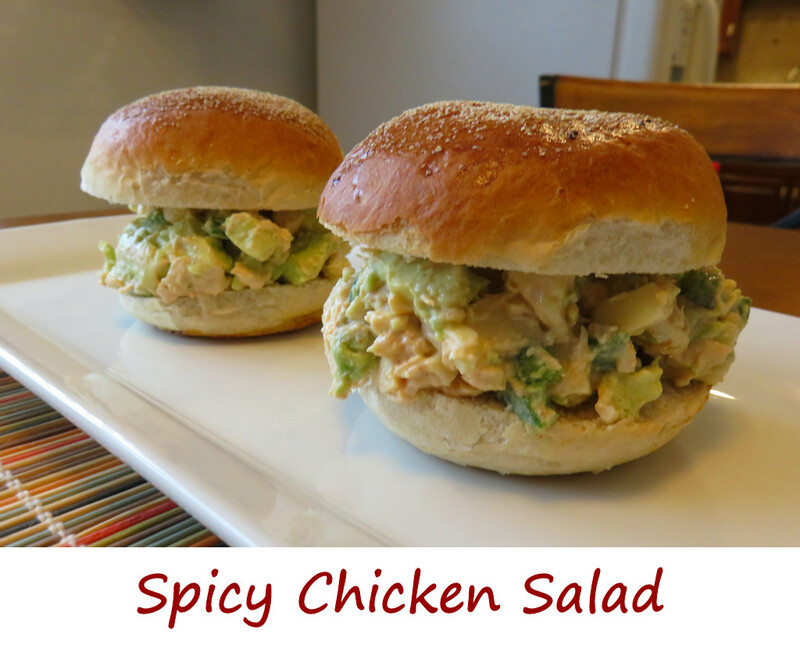 Also try my creamy smoked chicken salad sandwiches. In a bowl mix together the chicken, celery, Worcestershire, salt, pepper and mayonnaise. Open crescent roll cans and separate dough into triangles. Add a half slice of cheese to the center of each piece of dough. Top with 2 tablespoons, more or less, of the chicken salad and roll up the dough as you would a regular crescent roll. Sprinkle rolls with poppy seeds. Transfer rolls to parchment paper- or Silpat-lined baking sheets and bake for 18-20 minutes or until golden brown. I had some fried chicken leftover in the fridge. I’m completely ok with chowing down on cold leftover chicken. But I’m even more ok with chopping it up and using it in fried chicken salad sandwiches. It’s the perfect way to use up leftovers, and the perfect sandwich for a picnic. This is an incredible version of chicken salad. I love the buttermilk in the mayonnaise. The mustard adds a bit of kick. But all the flavors in the sauce mixture do not overpower the chicken. You can still tell that there’s fried chicken in there. It’s a great twist. Don’t have leftover fried chicken on hand? Any cooked chicken will do just fine in this salad. Want a spicier chicken salad? 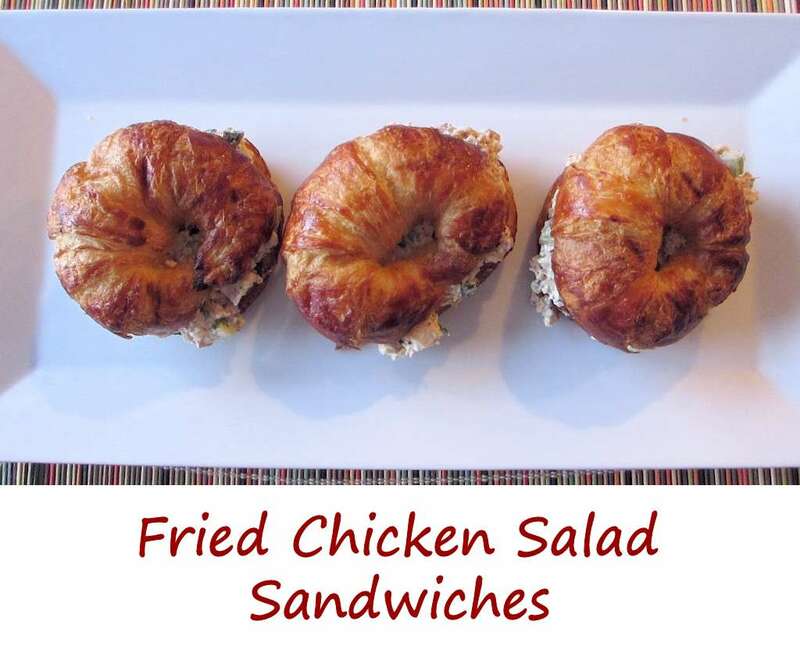 Try my spicy chicken salad sandwiches or my fried chicken breast sandwiches.